As tax time approaches, we are reminded how many expenses we have, often on crumpled up pieces of paper, or business cards from conferences, and when it departs for the next year we all probably make the same promise – “What a hassle, I need to be better organized next year”. The solution? Well, it’s generally held to be a scanner that captures the info, freeing you from paperwork. But most of those products pretty much stop short after capturing the data. As a technology analysts and reporters and as a curator we tend to end up with a stack of business cards after a conference, and not sure how to deal with them. Typically they end up in an envelope, or zip lock bag, or rubber banded together. None of these make actually using the information any easier. The same holds true for receipts, especially for cash expenses that don't have a credit card trail. In the past we reviewed the line of excellent scanners from Fujitsu, whose scanners set the standard for reliability and ease of use. We also worked with IRIS, a Belgium based company whose products are also highly regarded, especially in the OCR (Optical Character Recognition) space. But on the Mac side, most solutions had one major concern for us, which was that if you scanned in business cards, they all ended up in your address book. Not a few, but all of them. That is to say that none of the products we tested for the Mac OSX platform created a database unique from the built-in OS X Address Book. Not cool! Business contacts are one thing, and your address book might have a few business contacts, but not everyone you met on your recent trip to the Consumer Electronics Show, or a charity golf outing is necessarily deserving of an entry in your Mac OS Contact List or Address Book. In the meantime, Neat has been building a reputation for taking the data past the scanning phase and making it organized and accessible. Their latest product, the NeatConnect Wi-Fi Scanner + Software offers a scanner, the cloud, organizational tools, and mobile access in one product. Neat’s website states that, “NeatConnect transforms paper into digital files and sends them straight to the cloud — without a computer. At home or at the office, the wireless NeatConnect sends your files straight to Neat, email, cloud services, and wherever else they need to be.” And we were interested to find out how this worked in practice. 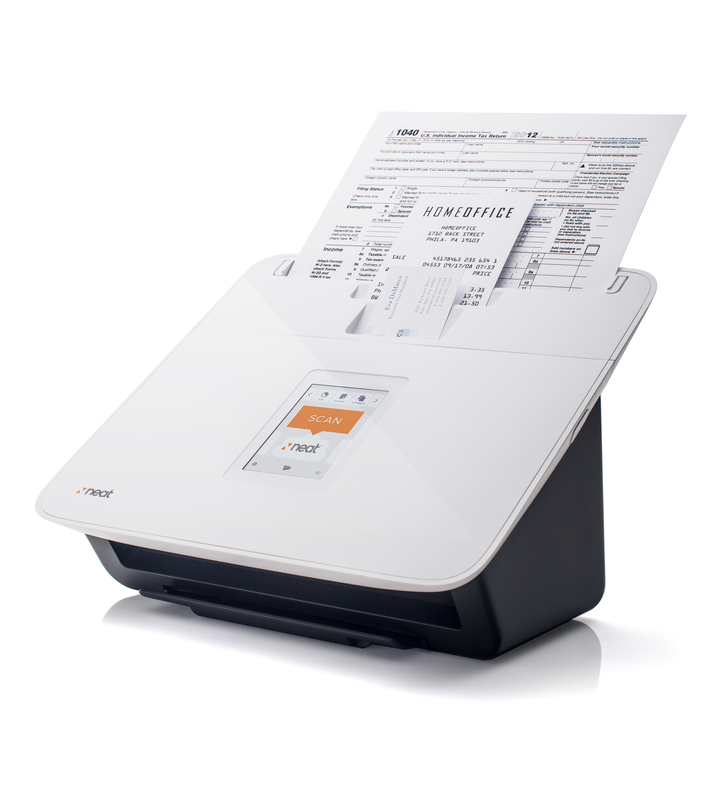 The scanner itself is a sleek white design that has separate slots for business cards, receipts, and letter size documents, although it could use a paper support for multipage feeds. It sports 802.11 b/g/n for fast wireless transfer speeds, the built in ADF (auto document feeder) can quickly scan single sided or double sided documents, in either color or grayscale, at up to 600DPI, and is quite speedy, with a claimed speed of 24 pages per minute. It sports the requisite USB port for a flash drive up to 32GB. Setup is simple. You start up the unit, follow the instructions on the small touch sensitive integrated color screen, and you are on the Neat cloud. As long as you have a Wi-Fi network you can access you are up and running in a few minutes. Alternatively you can plug the unit directly into your computer, and avoid the cloud based approach, which given the tenacity of hackers, might be the safest approach preferred by the extra cautious or paranoid. But… you would miss the ease of access the Neat cloud provides. From a tech basis, the scanner is quite good, capturing even fine details and scribbled scrawls from our receipts, and notes. From the packaging to the instructions everything has the Apple vibe, clean and tidy, the instructions and software have unique packaging. We installed the software on a MacBook Pro and Mac Pro, both running Yosemite, and installation went off without a hitch. The first document I scanned was handwritten notes from a meeting, and I was able to read it on my computer, and properly categorize it. The next was a set of cards from a press event held by Pepcom, one of which was a complimentary code for Gogo so I could try the service on the next supported flight. This scanned ok, but quickly asked for name, address, company, etc., so not a perfect fit, but this card was after all on a business card sized form factor. We scanned additional docs, and things worked fine, allowing me to detail the event, the people, and other information. Neat for Mac version 4.3.0 worked fine, I did have one crash, but since Yosemite has proven to be the most troublesome Apple Mac OS update we have ever tested (going back to OS 9) this didn't alarm us, and it only happened once. It is however an application with much more capabilities than are obvious at first glance. Its GUI is solid, with nice adherence to Apple’s design protocols. According to Neat “Data can be exported to Excel®, Quicken®, TurboTax® and Mac Address Book.” You can search, add notes, create personal and business filing cabinets and more. Using the Neat application on the Mac, revealed some pretty funny file names applied by the scanner for the PDFs. For example, when we scanned some college financial aid forms, the file name was a combination of the page number, some random words, and finally a $ dollar sign with an amount. So, the first task was to properly rename the scans. The next was to categorize them, and lastly download them to our computer. We discovered that the app supports drag and drop, so you can select the scans you want and simply drag them to the desktop or into a folder of your choice. You can also scan to the "Cloud" service of your preference, a nice option. We think that Essential will probably do the trick for many folks, as losing Quickbooks Online, and integration with Constant Contact, Campaign Monitor and MailChimp, may only affect a few users with more specific needs. The unit I received however came with 90 days of free service, after that a purchase of a plan is required. At press time the free service was increased to a year, but it didn’t matter, mine was cancelled precisely 90 days after I set up the unit. You don't need to purchase a plan to use the scanner, and you can still scan direct to a computer with the Neat App installed, and you can still use WiFi to upload the scan, and download to your computer or phone. Neat considers the cloud to be their backup system, so that your files reside on the cloud, available for download or use at any time. If you don't have the cloud, the scanner is connected to your WiFi network, and available to the Neat app, but without a backup to the cloud, and unavailable using the iOS or Android Neat app. Online reviews tend to paint a negative view of the company’s support service, so I tried to reach a representative at the company using their toll free number, but the voicemail tree led to more voicemail, and constantly referred me to their website. An hour into calling and getting disconnected, I finally selected the Sales option and immediately reached a polite man who was helpful and helped me understand the pricing options and what was included, and who naturally wanted to sell me a renewal plan. After a couple of hours of trying I had no luck reaching anyone else at the actual company and not the call center. I tried to contact the company over the next week with no luck, their actual business and corporate number is carefully shielded from consumers. You can probably reach the White House Situation Room easier. The reason for my call was simple, I wanted to better understand how the scanner can be used if one chooses not to renew the cloud plan. But because the Neat voicemail system wouldn’t recognize my phone number or e-mail, despite receiving a stream of e-mails for the past three months encouraging me to renew, I couldn’t actually talk to a tech support person, and instead learned some of what I needed from the sales agent. A quick look at Amazon revealed that over 50% of the review ratings were 3 stars or below. Obviously the company needs to take that frustration from consumers seriously, and my own experiences trying to reach someone on the phone confirmed the most common complaints. We think that Neat needs to rethink its approach to customer support, and make the company more transparent and easier to reach. From our testing, it seems that backup of the database should also be ramped up with additional options, and we would suggest that a simple backup preference, with an automatic backup to either an online cloud of your choice, such as Dropbox, or to either the internal or preferably an external Hard Drive be added to the software, and it would be important to export the database and not just files to non-proprietary standard format. As mentioned we took to just dragging and dropping scans to archive them, but as for the actual database we had less control. Not to sound cynical, but companies don’t always stay in business, especially in the tech sector, so it would be reassuring to customers to know they had an option for the long term. One thing I wouldn’t do is toss any receipts till well after the IRS doesn’t need them. One could of course export specific sets of data to Excel or other formats, but the key to the value of Neat is the database and categorizing. It would be great to have a FileMaker Pro option. We think the NeatConnect Wi-Fi Scanner + Software has many compelling features about it, allowing a great deal of organizational flexibility, a strong software suite of services, and high-quality scanning. However, we are concerned about their approach to customer service, and we would like to see a far more bombproof approach to backup options for the user. Hopefully, Neat will see this as an opportunity to improve upon these areas. Still, for many users Neat provides that critical first step in digitizing and categorizing the paper in your life.